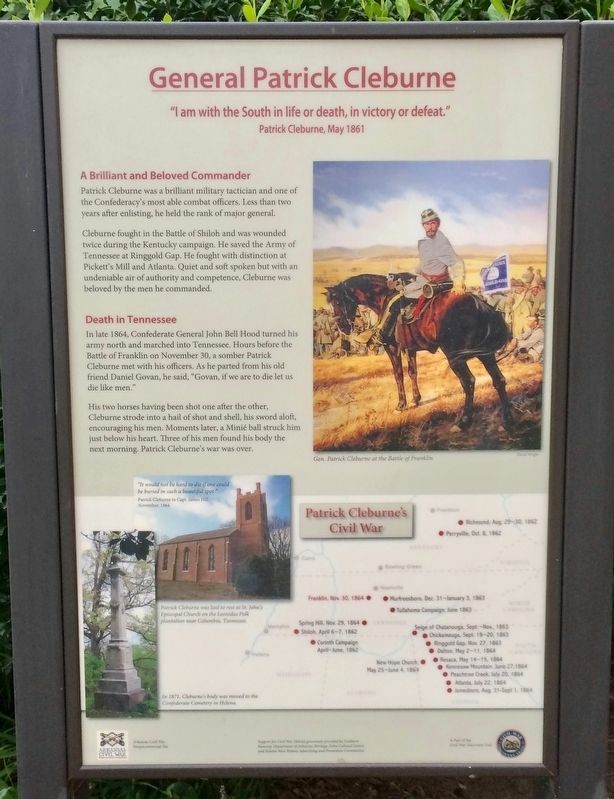 "I am with the South in life or death, in victory or defeat." Patrick Cleburne was a brilliant military tactician and one of the Confederacy's most able combat officers. Less than two years after enlisting, he held the rank of major general. Cleburne fought in the Battle of Shiloh and was wounded twice during the Kentucky campaign. He saved the Army of Tennessee at Ringgold Gap. He fought with distinction at Pickett's Mill and Atlanta. Quiet and soft spoken but with an undeniable air of authority and competence, Cleburne was beloved by the men he commanded. 2. General Patrick Cleburne Marker is 3rd one from his bronze statue. In late 1864, Confederate General John Bell Hood turned his army north and marched into Tennessee. Hours before the Battle of Franklin on November 30, a somber Patrick Cleburne met with his officers. As he parted from his old friend Daniel Govan, he said, "Govan, if we are to die let us die like men." His two horses having been shot one after the other, Cleburne strode into a hail of shot and shell, his sword aloft, encouraging his men. Moments later, a Minié ball struck him just below his heart. Three of his men found his body the next morning. Patrick Cleburne's war was over. Middle left: "It would not be hard to die if one could be buried in such a beautiful spot." 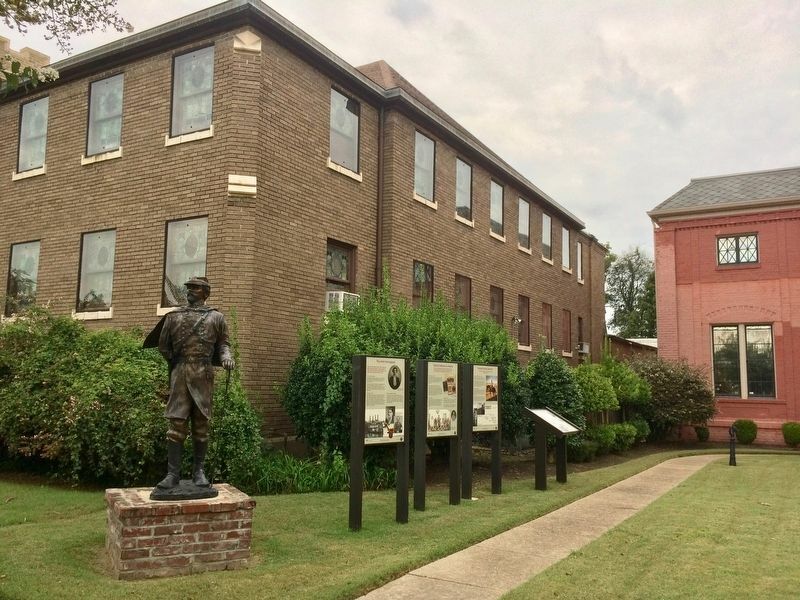 On October 10, 2012, a life size bronze statue of Major General Patrick R. Cleburne was dedicated in Helena, Arkansas at the Helena Museum. 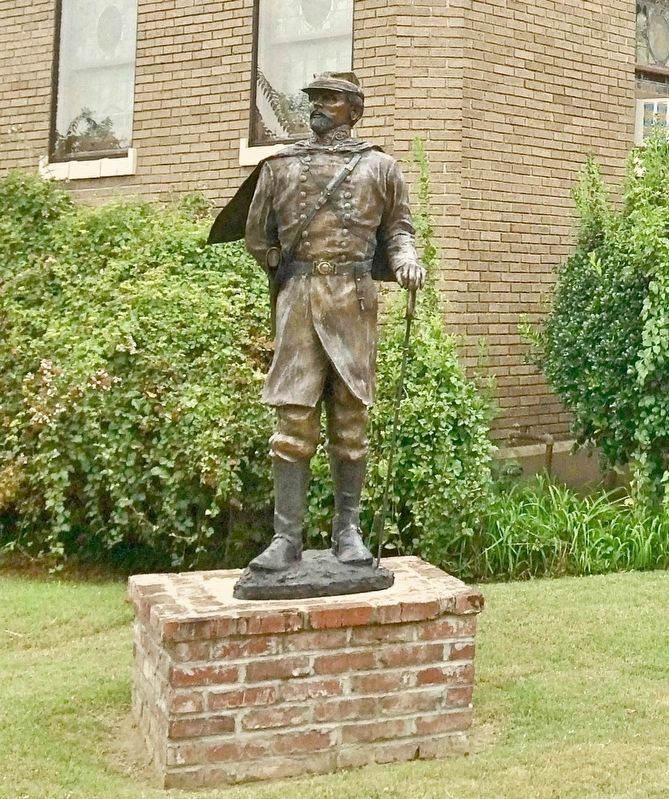 The statue is only a few feet from the property on which he lived before the Civil War started. Leonidas Polk plantation near Columbia, Tennessee. In 1871, Cleburne's body was moved to the Confederate Cemetery in Helena. Erected 2013 by the Arkansas Civil War Sesquicentennial Commission. Location. 34° 31.711′ N, 90° 35.321′ W. Marker is in Helena, Arkansas, in Phillips County. Marker can be reached from Pecan Street south of Perry Street, on the right when traveling south. Touch for map. Located next to the Helena Museum of Phillips County. Marker is at or near this postal address: 623 Pecan Street, Helena AR 72342, United States of America. Touch for directions. Other nearby markers. At least 8 other markers are within walking distance of this marker. Phillips County's Confederate Soldiers (here, next to this marker); Patrick Cleburne in Helena (here, next to this marker); The Irish Immigrant (here, next to this marker); The T-33 Shooting Star (within shouting distance of this marker); The American Legion Hut (within shouting distance of this marker); "We are all the same as dead men" (about 300 feet away, measured in a direct line); Arkansas' Mercí Car (about 400 feet away); Judge Jacob Trieber (about 400 feet away). Touch for a list and map of all markers in Helena. More. Search the internet for General Patrick Cleburne. Credits. This page was last revised on October 22, 2017. This page originally submitted on October 22, 2017, by Mark Hilton of Montgomery, Alabama. This page has been viewed 125 times since then and 11 times this year. Photos: 1, 2, 3. submitted on October 22, 2017, by Mark Hilton of Montgomery, Alabama.